For some Christmas may seem far away, but in Inishowen this November the festive season is beginning to come upon us. Across the peninsula there are many Christmas Craft fairs, the perfect way to spend a Saturday or Sunday afternoon browsing among all the unique products and perhaps picking up a few Christmas gifts along the way. 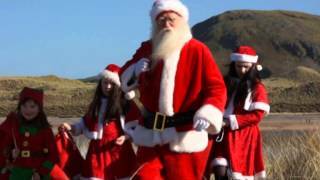 Inishowen is home to many brilliant Santa Experiences. Santa’s is very busy in the Isle of Doagh and Buncrana spreading the Christmas cheer while entertaining the whole family and presenting gifts to the little ones. With ample accommodation, some even make a weekend break for the family in the lead up to Christmas. v Santa’s Island returns with a new purpose built visitors centre and improved facilities. Shows run from Saturday 21st November until Wednesday 23rd December, Doagh Famine Village, Isle of Doagh, Clonmany.